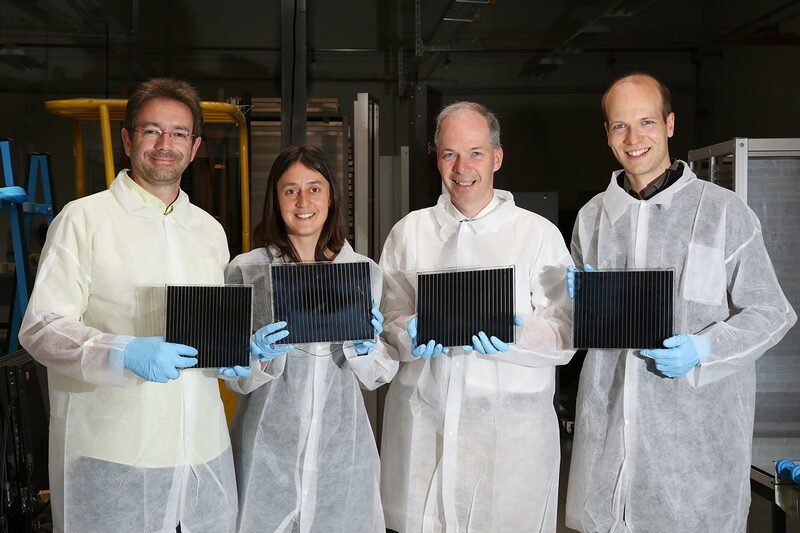 R&D Team at Solaronix, holding Perovskite Solar Modules out of their prototype factory. For the first time in the industry, 500 cm2 perovskite solar modules were produced using simple and ubiquitous printing techniques, avoiding otherwise commonly used and expensive methods such as chemical vapor deposition or metal evaporation. Printing has proven a reliable technique for Dye Solar Cell panel production in the company’s earlier achievements, further developed for this new application, it now makes the use of perovskite safe and clean. Unlike other perovskite solar technologies, Solaronix’ solar modules are solely made of low-cost and widely available materials produced and formulated in-house, such as ceramics, and of course, perovskite. Arriving at the conclusion of a two year Swiss Confederation’s Commission for Technology and Innovation (CTI) project with academic partners at EPFL and Aalto University, this pioneering work allowed Solaronix to transpose laboratory perovskite solar cell samples of ~1 cm2 to a more significant area hundreds of times larger, with no performance drop. The solar modules produced and tested at the company’s premises already reached 12% solar-to-power efficiency, comparable to other thin-film photovoltaic technologies. Continuous 24/7 sun-like illumination evidenced the unprecedented stability of these solar modules, sustaining 5’000 h and still counting. That’s so far a 5 year equivalent to outdoor conditions. Thermal stress also revealed Solaronix’ perovskite solar modules behave ideally in the 50-70°C range, temperatures typically reached under sun exposure, in contrast to silicon solar cells which suffer a significant performance drop with increasing temperatures. Solaronix is the first company to demonstrate stable and performant perovskite solar modules combining low-cost materials and scalable industrial techniques, paving the way to the commercialization of a disruptive thin-film perovskite photovoltaic technology. Being a pioneer in next generation photovoltaics, Solaronix started with the development of Dye Solar Cell technology, leading to the world’s first colorful and transparent 300 m2 facade on EPFL’s SwissTech Convention Center in 2014. Strong of this past experience, the company now focuses on Perovskite Solar Cell technology, and has the ambition to disrupt solar energy with the most effective renewable source of electricity. Meanwhile, Solaronix continues to supply specialty chemicals and components to the various research centers, academic laboratories, and pioneering enterprises working on next generation photovoltaic technologies around the world.